What a buzz! Last night we ran our monthly Milonga de Mis Amores at the Gladesvillle RSL and after hearing so much about our fellow Aussies - including some dancers - suffering in the biggest floods in decades we decided that we would make it a fund-raiser. We put $4 from every entry into the Flood Appeal (we raised $224), plus we had a donation box ($84.05) and we created a few CDs which we sold ($60) - and we rounded it off to $370. We were delighted! 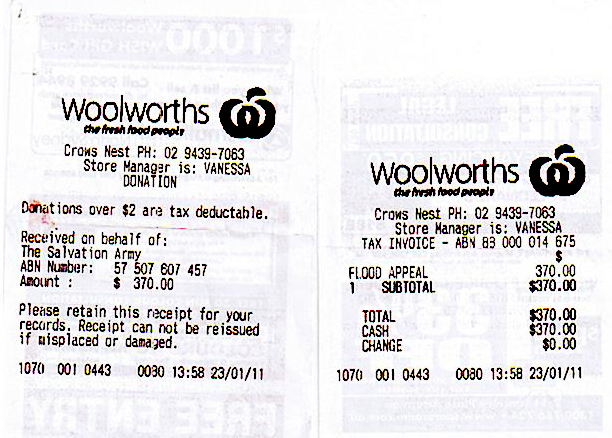 But even more so when Francis, one of our favourite tangueras, told us that Woolworths were matching flood donations. So today we visited our local Woollies and deposited the $370 (see receipts) which will be doubled and given to the Salvation Army Flood Appeal! How good is that? Thank you so much to all the dancers who came and enjoyed the music of our fabulous DJ Geoff, who has to have one of the very best collections of Golden Age and Old Guard music in Australia, munched on the lamingtons and alfajores and gave so generously - and to Jenny and Chris from Tango Encanto who danced so beautifully for us to Biagi ''Humillacion". My only disappointment is that more dancers did not come and support the cause. Frequently milonga organisers in Sydney support cancer and other popular fundraisers - I hope some will take advantage of this offer by one of our biggest retailers and contribute to what is going to be our nation's biggest cleanup in a disaster that has not yet reached its end. Congratulations. That's an amazing effort.